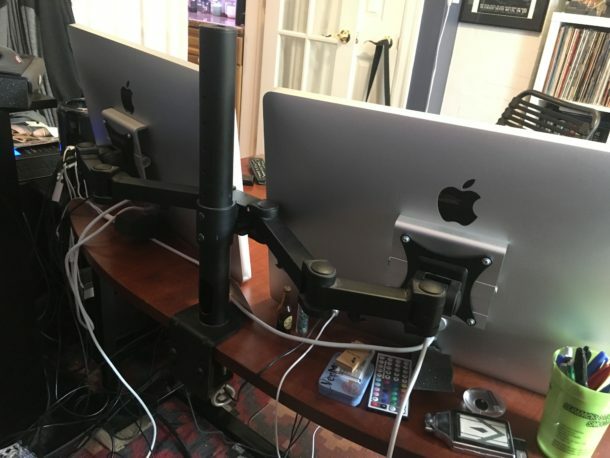 What do you do and use your Apple gear for? I’m a freelance engineer and mixer working in Music, Film/TV post production and radio, so I produce, edit, and mix audio. In a typical week I can be doing anything from editing and mixing feature films and documentaries to mixing music albums or producing podcasts. I’ve mixed for TV shows such as House Hunters International and currently mix the Here’s The Thing podcast for WNYC and The West Wing Weekly podcast. Recent projects include “Toucan Nation” airing Aug 24th on Animal Planet as well as upcoming feature films “Do You Take This Man” and “Bwoy”. What hardware is part of your Mac setup? I recently upgraded to the “trash can” Mac Pro. It is an 3Ghz 8-core with 64gb of RAM. I chose this machine because I was starting to reach the limitations of my 2010 quad-core Mac Pro. 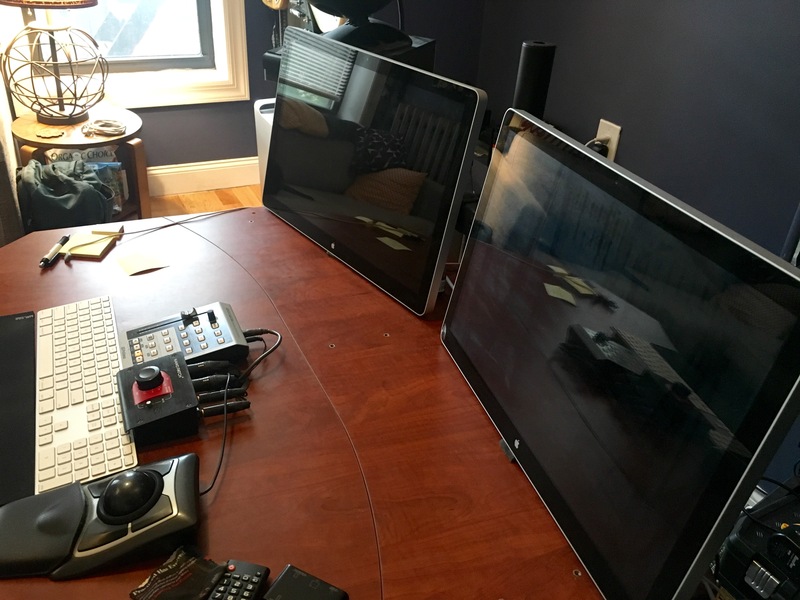 I’m also running dual 24″ Apple LED Displays, the last model before the new Thunderbolt displays. 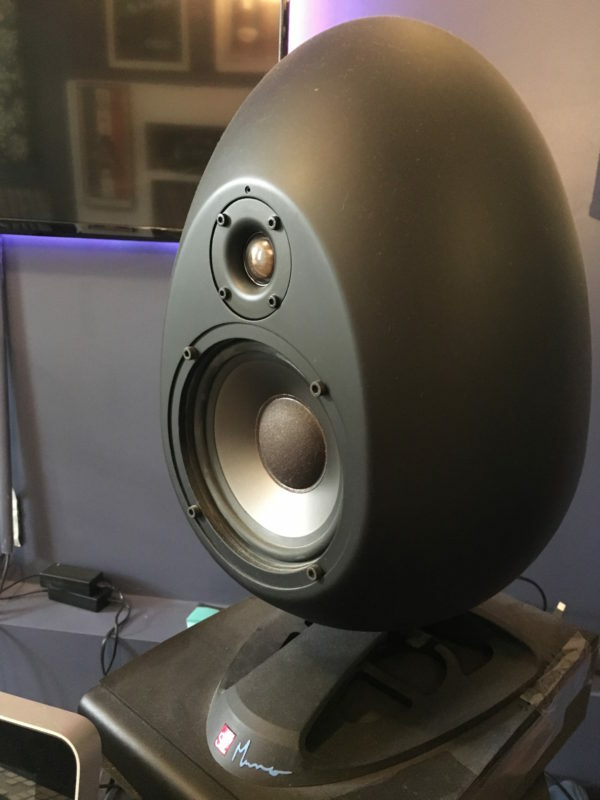 Speakers are sE Munro Egg 150 monitors. My peripherals include the Avid Mbox Pro, Presonus Faderport and a Nano Patch passive volume controller. Audio is processed from the Mbox pro via s/pdif to a Benchmark DAC1 which provides the D/A for my main monitors as well as headphone amplification. I use headphones exclusively for radio and podcast work. Headphones are Sony MDR-7506 and Grado Labs SR 325e. 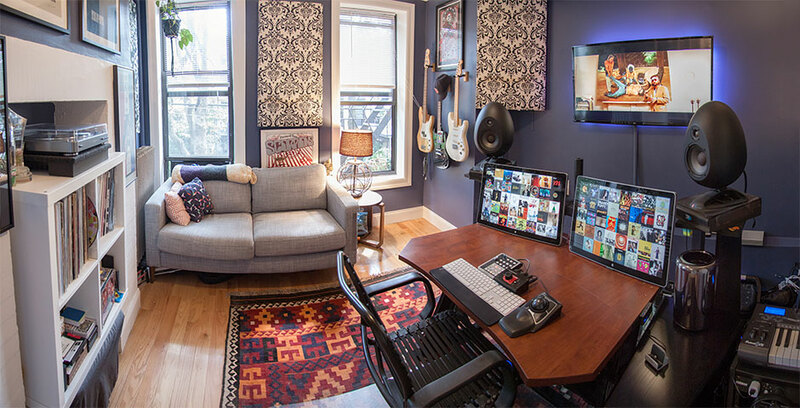 The Desk is the Studio Trends 46″ desk sold through Guitar Center. I use Pro Tools HD 12.5 every day! Other apps I can’t live without include Izotope’s RX advanced and insight plugins as well as many plugins by Waves and Audio Ease such as Altiverb 7. I also design and host my own website at www.zachmcnees.com which I use Adobe Photoshop and Lightroom for a great deal. Do you have any Apple tips or productivity tricks you want to share? It’s all about quick keys! Apple Tab to navigate quickly between apps etc. I’m glad OS X 10.11 finally has tabs for finder but I REALLY miss the full color files in finder! If you’re working with Pro Apps, it’s all about compatibility. Do research before updating your machine to make sure all your apps and plugins are compatible with your OS! Do you have an interesting Mac setup or Apple workstation that you want to share? Take some high quality pictures and answer some questions about your workstation, and send it on in! 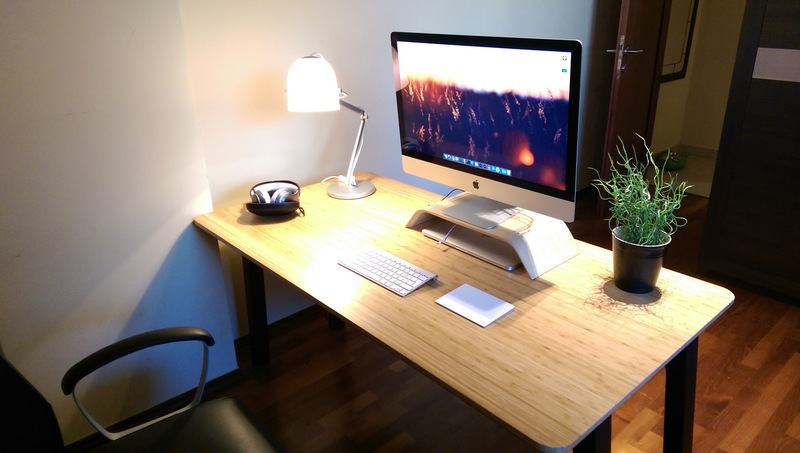 Love the Mac desks posts. Always a pleasure to read through. I must say any time I read about pro users and myself included I always feel bad that Apple is neglecting us and our hardware needs. The Mac hardware business is over $20 billion a year and surely it would be more if they updated the dang Mac hardware more than twice a decade! OS X = Cash Cow. Beautiful setup. But I wonder whatever happened to the ergonomic practice of placement of keyboards, mice etc on a lower surface at elbow ht. aprox. 22.5″ rather than the tabletop at 30″-36″? Nice office really good look to it. This is my desk :D https://i.imgur.com/v7AvTHc.jpg I’m an UI Specialist. what is that, where the display is standing on? is it good for an 27″ iMac? I echo the above comments I hope Apple updates Mac hardware soon. Best computers out there by a mile, just need updates. Im not a mac user but thats too cool!!!!! Extrafinder has been more or less bricked in El Capitan without removing crucial security features which i’m not willing to do. Nice desk setup. Looks like you are in New York City? The massive amount of reflective surfaces would make that an acoustical nightmare, and completely useless for any accurate monitoring. Too bad, the user has nice gear, but failed to treat the room and it’s contents properly, and thus it’s all wasted money. It’s not perfect of course, but the room does sound remarkably well, especially with a small bit of help from a graphic EQ built into my monitoring system. Most importantly, I KNOW what my room sounds like which allows me to work efficiently and accurately. It’s pretty dramatic to write off my entire room as wasted money. There should NEVER be ANY EQ on a monitoring system this is audio 101. With all that reflective surface around your monitors there is not a snowballs chance in hell it’s remotely accurate. While you can make compensations for it, the correct way is to treat these surfaces and the room to create an acoustically flat response environment. Otherewise, all you are doing is guessing. Is it ideal? No. I live in an apartment in Brooklyn, it works well. There are no laws in regards to audio, if something works, it works. I know my room, I know what my speakers sound like and I reference all of my work on headphones. I’ve successfully mixed feature films, albums and podcasts heard by millions of people. I’ll trust my ears over audio 101 rules. The Mac setup is fantastic, the proof is in the pics and in the work you have done. I advise to ignore ‘noway’ he is just the typical internet goober who has to complain about everything.